5/27/2013: The day of remembrance. I would have liked to have gone to a couple of gravesides and put flowers into place. That was not going to happen on Monday. If those individuals were alive today I'm sure they would understand, one being a farmer and the other a milk hauler, both Veterans. Here's the recap on the day. A glove was sucked into the milk pump, spent part of morning pulling pump apart and repairing. Neighbor needed his hay baled, we have are hay down too. Rain was suppose to come in the evening. 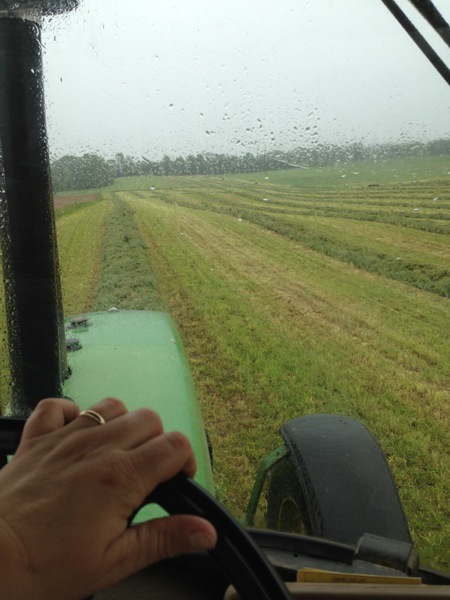 It started raining well baling hay. I blew the front tire on the tractor. We went and borrowed tractor from another neighbor. One more field to finish baler broke down. Yes, it's still raining! Hay is still in the field. Three heifers (new moms, new milkers) had their calves. The last calf we had to go find out in the tall grass. She kicked and fought my son, who was trying to keep her in the back of the pickup truck. We didn't finish chores until 10:45pm. It was a long day! But Grandpa would understand why I didn't visit his grave on Memorial Day. Will live or will die? That is the question. This cow was past due and we were concerned for her and her calf on 4/21/2013. Time to go in and check. The calf is backwards. She didn't want to lay down. We had to use a calf jack to help her birth him. He came out and was still alive. He had a lot of fluid in his lungs. The farmer said he won't live. So the question was will he live or die? The good news is Kinder is still alive. He's a fighter like his mama! In life sometime you may need a little push or a little pull to succeed! My kids are learning these lessons in the best way possible by simply playing! Yesterday was Sunday and we had someone show up on the farm to look at some heifers we have for sale. Here are my thoughts on Sundays and boundaries!Sunday is a day of rest, a day of worship, but most of all it's our family day! We still do the chores, milk cows, pick up eggs, feed animals but we also like to take a Sunday nap, have dinner with family. I have boundaries. I don't ask people not to come out to the farm but I do ask them not to come to the farm on Sunday. I also ask people to call ahead if they are coming out to the farm, that's just to make sure we are there to show them around. When the seasons change so does our availability. Farming after all is a business. We run our farm like a business. Our business is closed on Sundays. My house is not a place of business. I will not invite you into my house, please don't be offended, I set that boundary for family reasons. That is a safe haven for my children. I have many customers that come to the farm to pick up eggs and meat from me. I enjoy the fact that they love our farm and our products that the farm produces. I also appreciate that they understand and respect our boundaries. 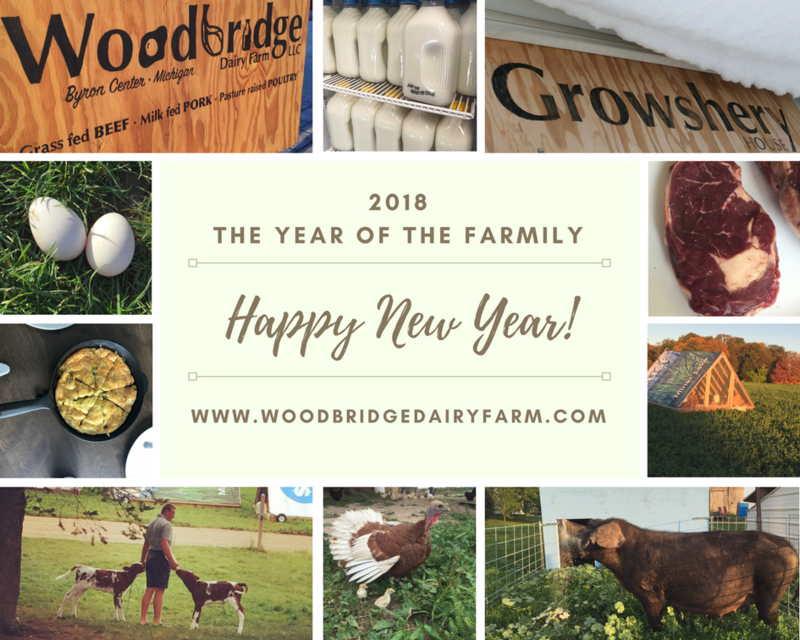 Our boundaries and No Sundays have worked well for us as a family farm. We do understand that there are exceptions to every rule. My hubby still has to sell those heifers, but Sunday is still the day of rest, a day of worship, and a family day in my life. "Special" Days don't matter when you're a Farmer! [slideshow]January 2nd is my husbands birthday, or Today! However, my husband is a farmer. He still has to do chores, cows get milked. Cows, pigs and calves all have to be fed. Today we went up to the other farm to feed the young stock, and this is what we found. A down heifer, she is hard to see in the picture because she was covered in manure and snow. This is how we cared for our down animal. First thing my husband did was check for injury and see if she could stand on her own. She was not injured but was not able to get up on her own. She was wet and shivering, the on set of hypothermia. Our job was to get her inside the barn, dry and warm her. We don't drag animals. We carry animals. We put the bucket on the tractor and worked on safely getting her into the bucket. This was a dirty challenge, we had to put a halter rope on her head and tie her head to her back leg. This sounds painful I know but its so that she can't hurt her self when she's being moved. We then scooped her up into the bucket. The second picture is of her tied and being moved to the barn. This went very well. She was untied by me and gently set down in a pen in the barn. The third picture is of her moving around getting comfy. I was waiting for my husband to carrying in a big bale of straw. I dried her off the best I could, that was a stinky job. We then buried her in straw. Straw is one of the best insulators you can find on the farm. The forth picture is of her buried in straw with water and food in front of her. She is now warm, dry and safe in the barn recovering from her ordeal. Happy Birthday to my wonderful husband farmer. It's his special day, but it doesn't matter what the day is when it comes to the farm. He's a farmer, his farm and animals come first. This applies to all holidays and special days, no matter what!